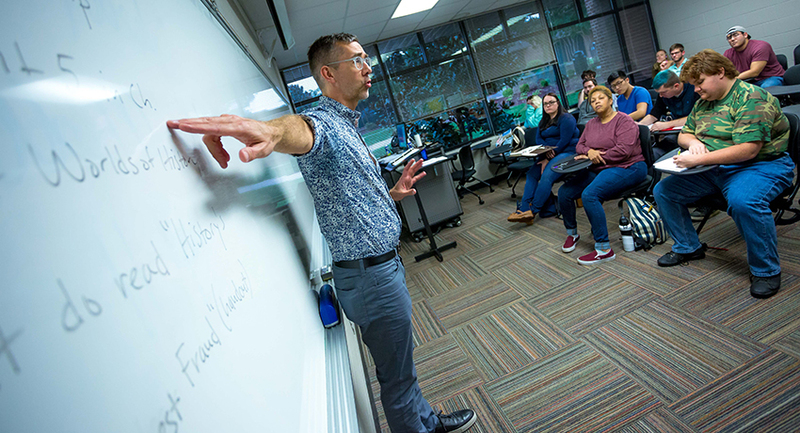 Spring semester at Volunteer State Community College is another opportunity for adult students to attend classes tuition-free with TN Reconnect. TN Reconnect is a statewide program that began this fall. Hundreds of TN Reconnect students are taking classes at Vol State this semester. The primary requirement is that people can’t already have a college degree. They can have college credits and those credits could apply to a Vol State degree. People who want to attend for the spring semester should apply now. For more information about TN Reconnect, including eligibility for adults, and links to apply to the college, visit www.volstate.edu/reconnect. The spring semester at Vol State starts on January 14. Course registration is open now for all students. New and readmit students will need to apply first. The application process can be completed online at www.volstate.edu/apply. Call 615-230-3688 for more information. Pictured: Associate Professor Merritt McKinney teaches a history class at Vol State.